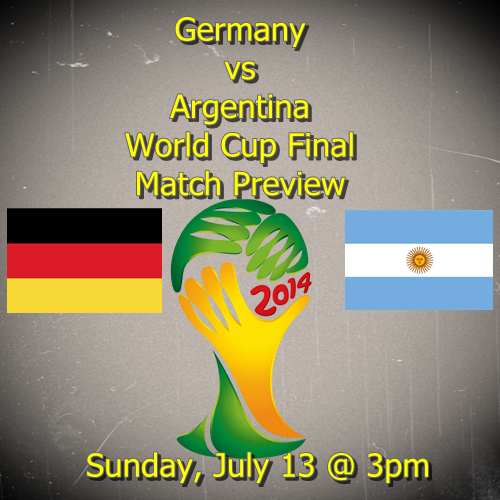 Germany and Argentina have advanced to the final match in the 2014 World Cup taking place this Sunday, July 13 at 3:00pm. Germany are coming in on the back of their demolition of Brazil while Argentina are limping in after a difficult 120 minute mediocre performance against Holland. This could be a great match, in fact, it should be a great match. Germany has finally come out of the blocks and showed the kind of team they truly are. They finally looked like a team in fifth gear. Prior to the 7-1 win over Brazil they never really looked like they had gotten out of second gear. They dominated matches, but always looked like they were holding something back. Argentina, on the other hand, look like they are in fifth gear, but spinning their wheels. I have been surprised by their defensive abilities. They have allowed just 3 goals all tournament, with all three coming from inside the area. This is mostly down to the talents of Ezequiel Garay in defense and Javier Mascherano just in front as their defensive midfielder. Mascherano has 13 interceptions (5th best in the tournament) while also winning 22 tackles (56%) for the most in the World Cup. In many ways this statistic points out the differences between the two teams. Germany has put in some of the best performances of the tournament, but no one player has truly stood out for them. Instead they have continued to play as a team compared to Argentina and their amalgamation of individuals. My prediction is a Germany win. It might take some time for them to find the breakthrough, but they have the ability to overcome this Argentina team. The fact that Argentina has made it this far does say something for their ability, but Germany had the much tougher test to get to the final, and they have passed it quite easily. The weather report for Sunday is looking mostly favorable. While it is supposed to rain in Rio De Janeiro up until Saturday, Sunday’s forecast is calling for it to be mostly cloudy. The highs are in the low 70’s with lows in the upper 60’s. The difficult part will be the humidity hovering around 80%, which will not be pleasant. There really shouldn’t be any changes in either side from last match with the exception of a possible return for Angel Di Maria.